A fireplace is a valued centerpiece to any room. It offers heat, light and ambience. It can also be a pain when it allows cold air in or hot air to escape up a chimney that is absent its damper. Solving this temperate problem isn't difficult, and can add decor to your space while saving dollars in your heating bills. The damper in a fireplace is designed to use the warm air that is circulating in your home efficiently. The sheet of metal or other material is usually found in the hollow of a masonry chimney, called the throat, and is located above the firebox. It is designed to close shut and seal off cool or warm air in the home from escaping when not in use. 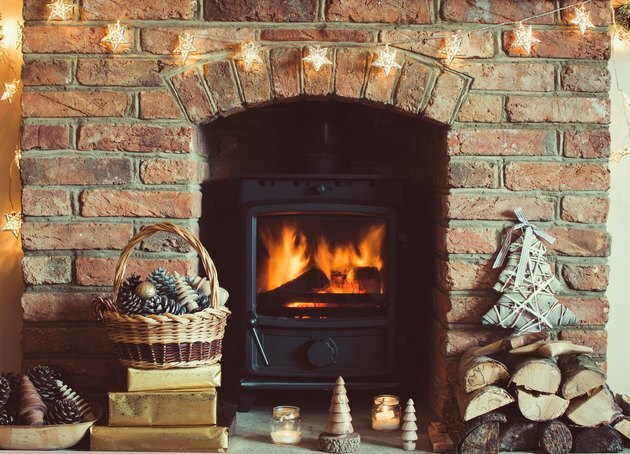 The heat will rise through the chimney, leaving your home open to drafts and chills. Cold air will also push down through the chimney and rob the room of warm air that is circulated from a central heating system. This "chimney effect" can easily add heaps of heating costs to your monthly energy bills. A draft eliminator, also called a chimney balloon, can quickly fix a damper issue. The small inflatables seal the chimney shaft from cold drafts coming in and warm air escaping up the chute. A few long breaths of air fill the bladder of the chimney balloon. It should fit snugly into the chute above the fireplace. If it tumbles down, take some air out until it sits firmly in the chimney. When you plan to have a fire, remember to remove the draft eliminator or the room where the fireplace sits will quickly fill up with smoke. The air bladder should stay as long as you need it and can be removed with a simple tug. Make sure to place it where you can easily get to the plug so if it expands over time, you can simply pull on the plug and let air escape to remove the chimney balloon. If you can't get a good seal with these inexpensive chimney plugs, clean out chimney for a better seal. Covering the fireplace with a door is decorative, efficient and relatively inexpensive. A wood board can be designed and cut to fit the opening of the fireplace. This can act as a damper and keep the chimney from sucking out hot air or allowing cool air to flow through the home. Glass doors that have vents can be more expensive but allow for a long-term solution to a physical damper inside the chimney.